In an online computer literacy class (fall session 2010) at The Art Institute of Pittsburgh, I created a Powerpoint Presentation dedicated to the life and work of California’s well-renowned first lady architect (and a civil engineer): Julia Morgan, AIA. 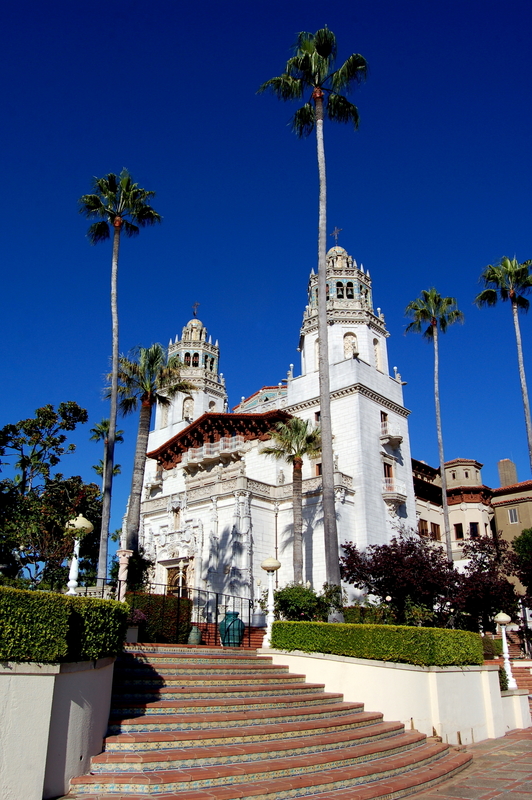 In mid-summer 2010, my family and I toured San Simeon, site of the famous William Randolph Hearst Castle designed by architect Julia Morgan, AIA. The road that leads up to the mountaintop complex is fairly steep and narrow and one can only get there by a tour bus running at regular intervals on a tight daily schedule. Each bus can seat about 50 tourists. Upon first arriving, you leave your car in the designated parking lot at the base of the mountain where you begin by entering the Visitor’s Center which houses a bookstore (featuring books about the life and architecture of Julia Morgan as well as the ranch lifestyle of WR Hearst). Before shopping, you need to buy your tickets first to make sure you get to see the castle. You can dine in the indoor atrium or outdoor terrace, have your family picture made with a backdrop of the pool (shown above), and then board the special shuttle bus. After a twenty minute winding ride to the top, you are greeted by a group of tour guides who host your group on a walking tour of the property (lots of steps, so drink plenty of water and get adequate rest the night before). The dedicated, experienced docents explain the architecture, artwork, and furnishings while offering interesting anecdotes of the lifestyle of Mr. Hearst and his friends. 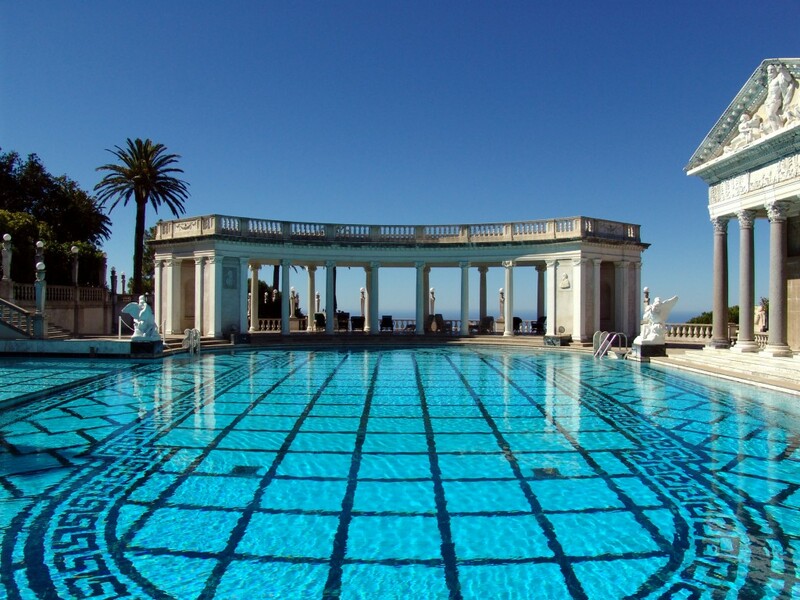 Upon concluding the 2-hour tour of two houses, the outdoor pool and bathing house, the indoor Roman pool, and the private quarters where Mr. Hearst entertained his guests, you can sit in his media room, circa 1920. Also of note is Mr. Hearst’s zoo– his property was also a dedicated animal refuge for zebras and other exotic animals, such as: Roosevelt elk, aoudads, tahr goats, sambar deer, and wild pigs. At one time, a train ran through the property, conveniently dropping off guests practically at the door. Part of the long trellis that covered the train depot remains intact today and is covered by grape vines. William Randolph Heart’s fabled castle San Simeon and its complex of buildings is built high on a crest of the Santa Lucia mountains overlooking the Pacific Ocean. Once you board the return shuttle bus, the trip down allows for more views of the Pacific Ocean; the tour guide informed us how Architect and civil engineer Julia Morgan designed the road first in order to get the building materials up the steep site. Donkeys and various vehicles were used to transport these materials. Back down at the welcome pavillion, there’s one more attraction worth seeing: a movie about the life of William Randolph Hearst, his family, and his father’s initial find that led them into a life of vast wealth and fame. Still a young school boy, his mother once took him on a tour of the world, specifically Europe– and this is what piqued his interest in the arts, architecture, and different styles as he watched, firsthand, the local artisans making glass-blown pieces and other regional hand crafts. The movie sweeps you into the life of a hard working and creatively industrious mogul; equally, if not more impressive, is the steadfast, ingenious work of Julia Morgan, AIA, whose work has at times been overlooked in many architecture curriculas. I’m intriqued by the life of Julia Morgan, who- at a time when women could not yet vote in the United States and were expected to act in certain roles- was inspired by her her mother’s cousin, Pierre Le Brun, who designed the Metropolitan Life Insurance Tower in New York City, she decided to become an architect and was accepted into the Ecoles des Beaux Arts in Paris. She had less than 3 years to finish the 4-year curriculum before the required age of 30! And she accomplished this while working her way through school, graciously declining monetary sponsorship by Phoebe Hearst, and while caring for her homebound brother who lived with her while she studied in Paris. Start planning your trip at least a month or more in advance. If you don’t live in California, you will need to fly into Los Angeles and drive North to San Luis Obispo or fly into San Jose or San Francisco and drive South on the scenic Highway 101. Check the tour schedulewell in advance and make sure there is room available for your party; there are a variety of specialty tours, both morning and afternoon; and a special Christmas Tour. Some days, there may be no tours due to weather or seasonal reasons; and sometimes it is rented out by private parties, closed to the public. Bring a jacket with you, dress in layers. You may get hot at the sunny hilltop; or, it might be very windy that day. Dress accordingly. Make sure your camera is ready to take lots of great images. Realize that some interior shots may not turn out as you hoped– unless you are an expert photographer and have the proper settings and flash figured out. Bring battery back-ups and plenty of disks. Don’t miss the movie– it is inspiring and tells you information the docents may not have time to share. Plan to spend the entire day there and be prepared to drive a bit in the late afternoon to make it to your next destination– whether it’s north towards Big Sur and Carmel or back down south toward Ventura County. Have You Toured Hearst Castle? If you have yet to visit in person, you can take a Virtual Tour right here (<-just click on the highlighted text). If you have been there, I’d love to hear your experiences, thoughts and impressions. Please share your story in the comments section below. I love your exhuberance for architecture and your appreciation for the contributions of women in the profession. And thank you for the email you sent me- have not yet had a chance to read through each attachment. We’re getting ready to put up our Christmas tree! My family and I have been to the William Randolph Hearst Castle several times and it is incredible. The fact that it was designed by a woman long before women were thought capable of such undertakings makes it even more so. So glad to hear you and your family have visited the Hearst Castle several times. That is awesome, given it’s not an easily accessible place– or maybe it’s just me as I do like to meander and loiter when I travel! Do you plan to visit San Simeon again soon? I’m hoping my family and I will get back there soon. I was glad to see that some new bridges were being built along Highway 101 (as some of them were beginning to look a bit rickety). I wish you and your family a very blessed, joyful Holiday Season!! I expect we will take a run up the PCH in about a year and revisit “The Castle”. When we lived in LA we took rides up north frequently but now that we have moved to Las Vegas we are seeing other sites. We just returned from Bryce Canyon which is worth your attention if you have not been there. About the website you referred to we are just getting it off the ground and should achieve a first page placement on Google shortly. Then the plan is to populate the website and make the connections. I’ve bookmarked, shared and joined the RSS subscription. Thank you! I see that my slideshare presentation on Julia Morgan is now missing– after the site was redesigned and improved. I will notify the webmaster and get this fixed Asap. In the meantime, you can view it directly on Slideshare. Here is the link: you can go to http://www.slideshare.net and search my name Tara Imani. You’ll find the slide presentation on Julia Morgan there.